Long time readers of this blog will have, by now, concluded Mags and I can be a bit obsessive. Perhaps it’s the monotony of the bunker, perhaps it’s some form of intellectual monomania we both share. In either regard, it’s fair to say when we latch onto something we really latch onto it. 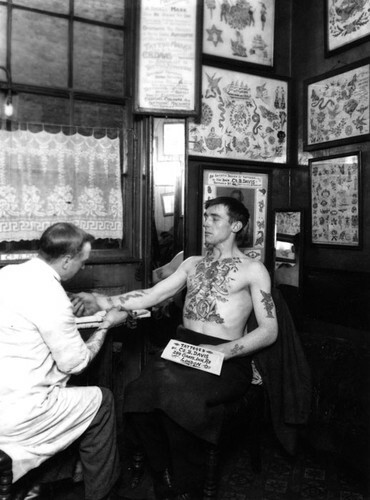 My obsession with the history of tattooing owes a great deal to the fine folks at Solid State Publishing and their sumptuous histories of George Burchett and Amund Dietzel. Both Burchett and Dietzel came to tattooing through their early careers as sailors. In the case of Burchett, I may have things reversed. He was forced to join the Royal Navy at age 13 as we as expelled from school at age 12 for tattooing his classmates. Both men would begin to hone their craft on their sea faring colleagues and both would take up tattooing when their sailing days were over (Burchett absconded from the navy, the Norwegian Dietzel nearly drowned in a merchant marine ship wreck). Burchett would settle into an apprenticeship before opening his famous studios on Mile End Road and 72 Waterloo Road. His career would see him draw upon the rich history of tattooing, often incorporating elements of South East Asian, African and Japanese tradition into his work. 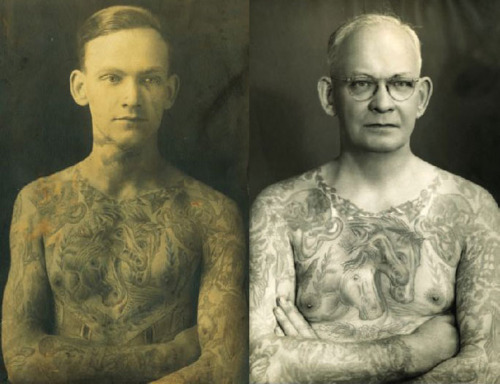 Before his death in 1953, he would tattoo European kings and pioneer cosmetic tattooing. His autobiography, Memories of a Tattooist, is a brilliant read and fetches a handsome price from collectors. Dietzel, following the previously mentioned shipwreck, found himself in Connecticut where he met British ex-pat tattooist William Grimshaw. They would fully tattoo each other before hitting the carnival circuit in order to draw income by exhibiting themselves. In 1914, Dietzel ended up in Wisconsin and began to put down roots. He continued to perfect his craft with two world wars providing a steady stream of soldiers and sailors from the nearby Great Lakes Naval Station eager for his attentions. Milwaukee banned tattoo parlors in 1967 with Dietzel commenting, “At least it took the city fifty-one years to find out it doesn’t want me. Milwaukee used to be a very nice town.” Seven years later, Dietzel passed away. The amazing lives of these tattooing pioneers are presented in exquisite detail by Solid State Publishing. The historical photos and flash are worth the price alone. If you’re a fan of tattoos and tattooing history you owe it to yourself to pick these books up. This entry was posted on October 10, 2012 at 4:32 pm and is filed under Articles with tags amund dietzel, George Burchett, solid state publishing, tattoo history. You can follow any responses to this entry through the RSS 2.0 feed. You can leave a response, or trackback from your own site.